Learn just what the typical tuition is for American colleges, and how Brown Mackie College - Albuquerque compares. See how tuition and fees at Brown Mackie College - Albuquerque measure up to the average and see what you can do to properly prepare for probable college tuition growth. How do Fees & Tuition at Brown Mackie College - Albuquerque Compare With Other Colleges? For nationwide, regional and statewide comparisons, view the table below to find out how Brown Mackie College - Albuquerque compares to other colleges. In the 2017 - 2018 school year, regular undergrads at Brown Mackie College - Albuquerque were billed $12,852, prior to corrections for financial need. Of that number, the price tag on tuition came to $11,952. $900 was fees. Unfortunately, this college doesn't provide any tuition discounts to residents of the state. How much does Brown Mackie College - Albuquerque cost part time? Find Brown Mackie College - Albuquerque cost per credit hour here. 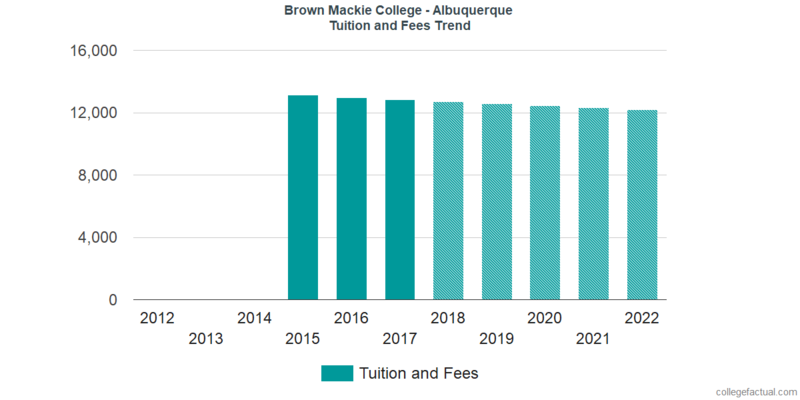 Tuition and Fees for out-of-state Brown Mackie College - Albuquerque students actually decreased by an yearly rate of 1.1% over the past five years. Tuition improved by -0.7% and fees improved by -5.0%. Based on this, we expect the price tag on tuition and fees this year will be $12,714. This means you could end up paying $25,293 in two years, and $50,047 in four years. There may also be other expenses related to your degree, such as room, board, books, and transportation. Look at the following chart to find out how Brown Mackie College - Albuquerque tuition and fees might grow in the years to come. Mainly due to the cost of living as well as other variables, the cost of college tends to grow each year. For this reason your last year of school will be much more expensive than your initial year.